Hamburg: Rowohlt Taschenbuch Verlag GmbH, 2003. This is the German paperback edition of The Wailing Wind, translated into German as "The Golden Calf" by Fried Eickhoff and published in 2003 by Rowohlt Taschenbuch Verlag GmbH, Hamburg, Germany. 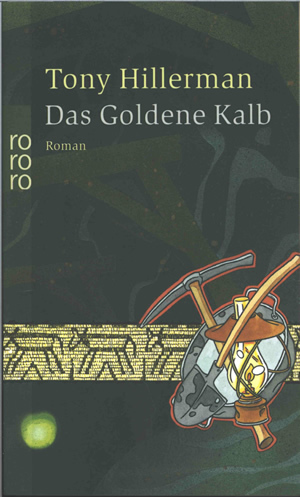 The front cover features the author's name and title, the publisher's logo "ro ro ro" in a green rectangle, a composite graphic of mining tools and a band of a petroglyph-style drawing of a cow, over a stylized drawing of the interior of a mine shaft. Inside front and inside back covers are blank. The back cover contains the book synopsis in German, praise for Tony Hillerman from Publisher's Weekly, the publisher's logo, the bar code and price on a black background. Contents:  Publisher's logo, [2-3] map,  publisher's logo, author bio,  title page,  original title notice and copyright, 7- text,  author photo, list of Joe Leaphorn/Jim Chee novels in chronological order with ISBNs, Das Goldene Kalb thumbnail and synopsis. Binding: Paper covers, dark green to black background, front cover illustration.